P Hotels, Argentina’s leading boutique hotelier, today announced the grand opening of the newest addition to its luxury boutique hotel collection. Arelauquen Lodge is a classic intimate mountain hotel located just outside the lakeside resort town of San Carlos de Bariloche. The lodge commands one of South American’s most picturesque sites on the grounds of the prestigious Arelauquen Golf & Country Club. 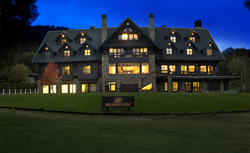 A meticulous, multi-million-dollar renovation of the 2012 acquisition has transformed the lodge into a five-star property that houses a world-class restaurant. Set amidst the spectacular peaks of Patagonia, Arelauquen Lodge and its elegant 28 suites overlook postcard-perfect Lake Gutierrez. All of the suites include flat-screen televisions, complimentary Wi-Fi, spacious bathrooms, in-room safes, kitchenettes for comfort. Guests can have their kitchenettes fully provisioned with groceries and beverages prior to arrival and they will appreciate that the lodge is Bariloche’s only hotel with air conditioning. The luxury boutique property also offers an indoor/outdoor swimming pool, sauna, gym, and a kids club. Golfers have access to Arelauquen Golf & Country Club’s 18-hole championship course at preferred rates and also its polo club, both considered to be the best in the region. Cerro Catedral, South America’s largest and most famous ski resort, is a mere ten minutes away. The resort’s 38 lifts access an incredible 1150 meters (3,773 feet) of vertical descent and 1200 hectares (2965 acres) of skiable terrain — during the North American summer. The lodge offers a shuttle to and from the ski area during the South American ski season. Superb fishing, biking, hiking, hunting and many other diversions are also close by. Prior, during and after a day full of recreation and adventure, Arelauquen Lodge guests are treated to culinary delights at its five-star restaurant “EPIC”. Here, Chef Martin Erkekdjian blends international cuisine with regional inspiration in an unforgettable mountain setting. His menu presents unique creations which are notable for top quality, carefully selected local ingredients. Chef Erkekdjian is an Argentinian who has been tutored by world-renown chefs such as Alex Atala, Pierre Gagnaire, Thomas Keller, Marcus Samuelson, and Fernando Trocca. P Hotels’ other properties include Palermo Place and Palermo Tower in Buenos Aires’ trendiest district. Its new Auberge du Vin, in the heart of Argentina’s internationally renowned Mendoza wine country will open August of this year. Although each P Hotel is noted for their superb locations and intimate ambiance, the properties are most often praised for the friendly, highly personalized service provided by the knowledgeable staff members. For those with a larger appetite for the delectable Argentine lifestyle, Rubio has introduced a worry-free, no-hassle way to own real estate in all three locations. He has teamed up with DCP International, which pioneered the luxury residence club concept, to create The Residence Club of Argentina (http://www.ResidenceClubOfArgentina.com). The Club’s members have an equity interest in suites within each of the new P Hotels and unlimited use, subject only to use by other members. One of the most attractive aspects of the unique residence club offering is that the P Hotel staff takes care of all the ownership responsibilities and makes each Argentine vacation seamless, whether the visit incorporates one or all three of the Club locations. Residence Club of Argentina owners are also members of Elite Alliance (http://www.EliteAlliance.com), an exclusive vacation exchange offering travel options at dozens of other luxury residence clubs in world-class destinations across the globe. “The only thing our Club members have to worry about is when they are returning for another amazing vacation,” Rubio said.